The old stage drivers of the Pacific Slope during the fifties and sixties [1800s], nearly all of whom have themselves been driven over the “Great Divide” were the last of their race. Time was, however, when the man who held the ribbons over a six-horse team on the summits of the Sierra and in the canons of the Coast and Cascade Ranges was more highly esteemed than the millionaire or the statesman who rode behind him. He was, moreover, the best liked, and the most honored personage in the country through which he took his right of way. He was often a “hail fellow well met,” but he was the autocrat of the road at all times. His orders were obeyed with the greatest celerity [swiftness], and he was always the first to be saluted by the wayfarer, the passenger, the hostler, the postmaster, and the man at the door of the wayside inn. Our Sierra Jehu, was generally an American, in most cases from New York, Ohio, Pennsylvania, Tennessee, Texas, Missouri, New Hampshire, or Maine. All, or nearly all, of his class had been through grammar or higher schools, some of the colleges, as well, and a majority of them had pronounced opinions on politics and theology and could converse rationally and cleverly on all ordinary subjects. All were gentlemanly and accommodating and favorites with the women who lived along their routes, few of whom they addressed except by their Christian names, while the pretty, plump, sixteen-year-olds they would tap familiarly under their chins. Some of the Jehus were young and green in the service, but the majority were grim and gray and professionally artistic. There were those who never indulged in liquors or wines of any kind; there were those who occasionally “spreed it,” and there were those who could not keep their teams on the grades unless they took a “couple of fingers” at every inn and “joined” the “outside traveler” moderately often between “changes.” No person ever gave a California stage driver a small coin, as one would a porter or a waiter; but a nice slouch hat, a fine pair of boots, a pair of gloves, silk handkerchiefs, or good cigars, were always acceptable. These old-time drivers all dressed in good taste. Their clothes were of the best cloths, made to order; their boots and gauntlets fine fitting and of a good pattern, and their hats of a cream-white, half stiff and half slouch. Most of them used tobacco in various forms. Many of them were perfect Apollos. 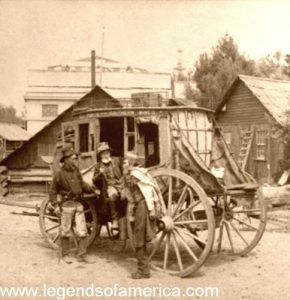 One of the best-known of all Sierra whips was “Alfred,” [George Monroe] a mulatto, who for a number of years, up to the time of his death, drove a stage daily between Wawona and Yosemite Valley. Probably no man, living or dead, has ever driven so many illustrious people. Grant, Garfield, Hayes, Elaine, Schurz, Sherman, Senator Stewart, Senator Morgan of Alabama, and hundreds of other Senators and Congressmen; governors of many of the States; Bull Run Russell, George Alfred Townsend, Charlie Nordhoff, John Russell Young, and scores of other eminent journalists; Albert Bierstadt, Thomas Moran, Tom Hill, C. D. Robinson, and other famous artists; Mrs.Langtry, Lady Franklin, the Princess Louise, and many hundreds of other persons of consequence, have been taken into the great Yosemite by Alfred. He never had an accident; always made time, either way, to a minute; knew every peak and tree and rock and canon and clearing and hut and streamlet by the wayside. He was of medium stature, and weighed 165 pounds; he dressed neatly and wore the whitest and handsomest gauntlets of any driver in the Sierra. 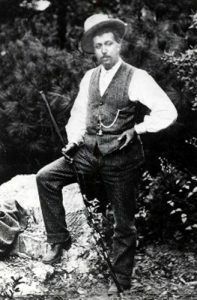 He was of a melancholy nature, oft times driving the entire distance from Wawona to Inspiration Point without uttering a word or relaxing a feature. But if he had a jolly crowd behind, he would watch his team carefully and listen radiantly to the jokes, stories, conundrums, and conversation, of those in his charge. The last time I saw Alfred I was a Yosemite commissioner and went over the mountains with him alone. He had on a new pair of gauntlets sent him by Senator Morgan of Alabama and a fine whip presented by Mrs.Langtry. He said that he had never permitted but one man to take the reins from him in his life, and that was President Grant. “The General drove nearly all the way to Inspiration Point,” said Alfred, “and lighted at least four cigars. He took in everything along the road and made all the turns as perfectly as an old driver. I had a fine crowd that day, the General and Mrs. Grant and Ulysses, Jr.; Mr. Young, who has since been Minister to China and is now Librarian of Congress; and there was Miss Jennie Flood, the only daughter of the wealthy bonanza man, who was jilted by young Grant; Miss Dora Miller, the only daughter of Senator Miller, who is now the wife of Commander Clover, United States Navy, and Miss Flora Sharon, who afterwards married Sir Thomas Hesketh of England. 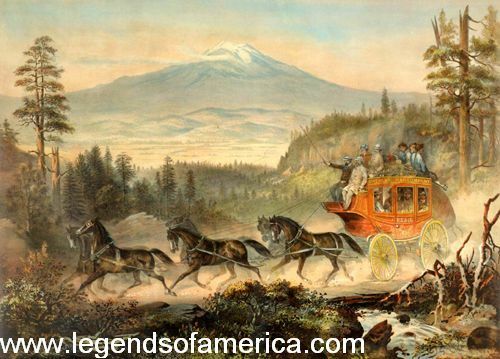 On the 17th of August, 1878, I rode over one of the summits of the Sierra from Quincy, Plumas County, to Oroville, Butte County, upon the seat with “Cherokee Bill.” This driver was not an Indian, but a regular Buckeye from the Western Reserve. He was a stout, clumsily-put-together creature, with stub beard, and drove a four-horse mud wagon.